A gorgeous rose gold addition to the beautiful Thomas Sabo free engraving Love Bridge collection. A stunning rose gold bracelet that has an extra special engravable bridge which allows you to personalise your bracelet with an unforgettable moment or special someone. 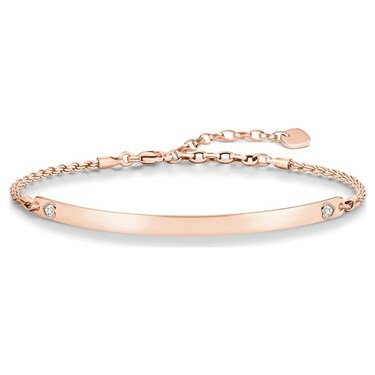 Crafted from 925 sterling with 18k rose gold rose gold plating this bracelet features a filigree bracelet, extendable chain and a sleek engravable bridge with 2 dazzling cubic zirconia hearts.